In this pioneering study of Jewish thought in the past two decades, Jonathan Sacks, the Chief Rabbi of the United Kingdom and the Commonwealth, explores how Jews have sought ways back to tradition in an untraditional age. He addresses a crucial dilemma for Jews and Judaism today. The Holocaust and the birth of the state of Israel have combined to create strong contemporary awareness of peoplehood – of Jews as sharing a common history, destiny and responsibility. But can there be peoplehood across the deep religious and cultural divisions that are the heritage of the Jewish encounter with modernity? 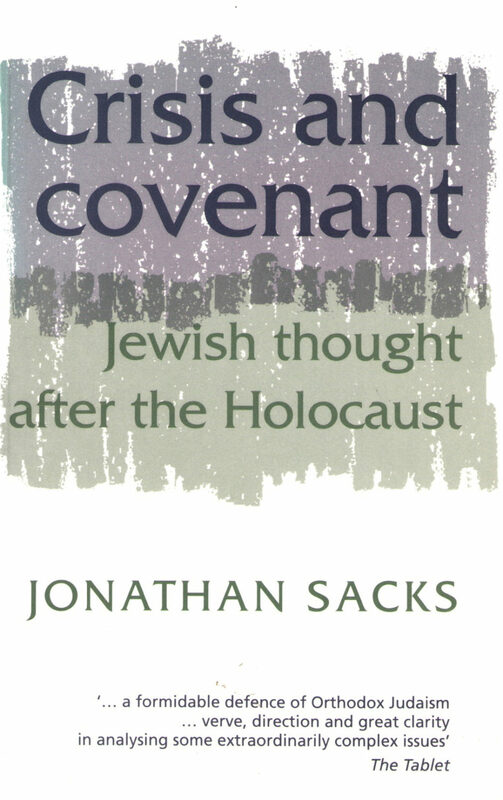 He explores the responses of contemporary Jewish thought to this dilemma, through an examination of its understanding of the concepts of covenant and peoplehood; of the nature of religious pluralism within a Jewish context; of the relationship of Jewish law to contemporary society; and of the interpretation of religious texts today – the question of Fundamentalism. Rabbi Sacks assesses the thought of Joseph Soloveitchik, Yeshayahu Leibowitz, Eliezer Berkovitz, Michael Wyschogrod, Irving Greenberg and David Hartman. He reveals the acute inner tensions when a religious tradition collides with modern consciousness. Crisis and Covenant is essential reading not only for those scholars and students of Jewish thought and modern Jewish history, but for all those concerned with the fate of religious traditions in a secular age.